So we’ve reached the end of The Bible… well at least the end of the ten episode television series. It’s been quite a journey across the last seven or so weeks and ratings for the show have dwindled. But last week we saw the final two episodes play out. Nine’s promo team lured us in with another big claim: ‘The greatest comeback of all time!’ which is actually pretty true. We saw the agony of Jesus’ death on the cross, but also the hope of new life through his resurrection. Last week’s episode Betrayal counted down the week leading up to Passover, or, Jesus’ death on the cross. Passion picked up with 12 hours to go. It was a pretty emotion-driven episode. It certainly wasn’t easy viewing. Jesus is chained like a criminal, given lashing after lashing, forced to wear a crown of thorns and of course, hung on a cross. Seeing the nails driven through his hands, I found myself wincing and turning away from the screen. But unlike much violence and gore that we’re shown these days – this is reality. This really happened. We get a condensed 40-minute and M-rated version but the real thing took a lot longer and would never be fit for television. There’s a lot that was done in this episode that should be applauded. All through the episode the crowds follow Jesus. And every time we saw shots of a crowd we got a brief glimpse of the personified Satan character lurking around. And we know that Satan = temptation. It’s crunch time for Jesus but he never acknowledges Satan nor is swayed by him. The producers use great irony in this episode. The opposition to Jesus mounts and the high priests scramble to see this ‘blasphemer’ put to death. 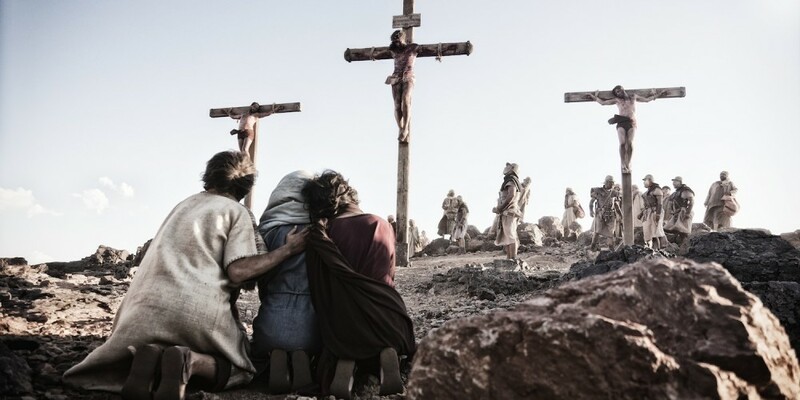 They plead to Pilate to put Jesus to death because if they were to do it, they would be ‘unpure’ so close to Passover. Jesus is the only one who can make them pure! And the ultimate line comes from Pilate about Jesus – ‘he’ll be forgotten in a week’. Jesus is crucified, and placed in the tomb. The idea that Jesus’ death takes away sins is only vaguely alluded to with brief parallels to the passover lamb, but is still effective. The time that Jesus spends on the cross, and his important statements there, are all very true to Scripture. It’s a moving episode. The episode begins as Mary finds the stone smashed outside the tomb. Jesus appears awash with white – he is alive! Peter exclaims that he’s not gone, ‘he’s back!’ and we’re away with an episode all about this good news going out to the nations. Jesus isn’t back for long in the scheme of this episode. He declares ‘go into the world and preach the gospel to all creation,’ and he’s gone! Soon we’re at Pentecost and there’s this well-handled scene of the disciples prophesying in different tongues (helpfully, with subtitles) – and the great thing is that they are prophesying. They’re stating Jesus is the Messiah, what he has done, and who he is. The disciples start healing people and attribute it all to Jesus. ‘Jesus did this!’ ‘Jesus isn’t dead. He lives!’. People start believing, and also, people start persecuting. Stephen is stoned as the first martyr and Paul enters the story and is a brutal, proud Jew. He screams ‘God is on my side!’ before being struck down and seeing Jesus on the road to Damascus. The producers (thankfully) spend a good amount of time on Paul’s conversion and his interaction with Ananias. Paul sets out his missionary journey and quotes both Amazing Grace and 1 Corinthians 13, well before it would have been written. Soon we reach a conclusive voiceover that tells us that most of the disciples died because of their testimony. It’s powerful stuff, and not your average ending to a television series. But, it’s still joyous, as the message has gone out faithfully, and, continues to do so. Look, I am coming soon! My reward is with me, and I will give to each person according to what they have done. I am the Alpha and the Omega, the First and the Last, the Beginning and the End. The series has helped us to see that sin is rampant, and a sacrifice is needed to pay for it. Jesus has died as our passover lamb and now reigns in heaven. The Bible is all about Jesus and looking back over these ten episodes, I think the show has been too. And to think this has been airing in primetime… wow! I hope this series has helped you to strike up conversation about who Jesus is with your friends. And it shouldn’t stop just because Nine have started playing The Big Bang Theory repeats on a Tuesday night. We have the original script to read with our friends. It might not be as quick as watching ten hours of telly, but it’s much more valuable. It’s God’s word to us! Ask a friend to read through Mark’s gospel with you – it’s a brilliant place to start. The Bible is released on DVD in Australia on October 23. Posted in TV ShowsTagged Bible, christian, Gospel of Mark, Jesus, Revelation, review, The Bible, The Bible seriesBookmark the permalink.